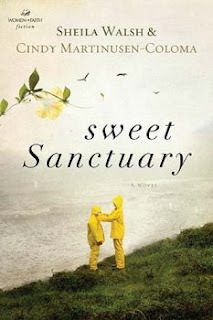 I recently read Sweet Sanctuary by Shelia Walsh & Cindy Martinused Coloma. This book is about a single mother named Wren. It tells about the struggles and sacrifices that a single mother must do to give your child everything you can. It is also about forgiveness and the importance of it in a family. This story takes place in a tiny town called Cottage Cove on the coast of Maine. Wren and her son Charlie are living on her family's land. She works in a library and charlie is in school and is very talented in music. Wren has not met anyone since her husband and Charlies father left them very long ago. When Wrens grandmother shows up as a surprise asking for a big party for her 90th birthday Wren is thrown into the chaos that is her family. All over again she relives her greatest fears and had to find a way to overcome them and forgive the ones who hurt her most. I really like this book and once i got into it i couldn't put it down. I would recommend this book to any mom who loves their child as much as Wren does. I recieved this book for free from Booksneeze where bloggers read for free.